We are still surrounded by snow here, and frankly the game of 'How-many-layers-can-I-fit-under-this-Betty-Jackson-jacket' is getting a bit tiresome. I am someone who dislikes having to dress out of a necessity to be warm. 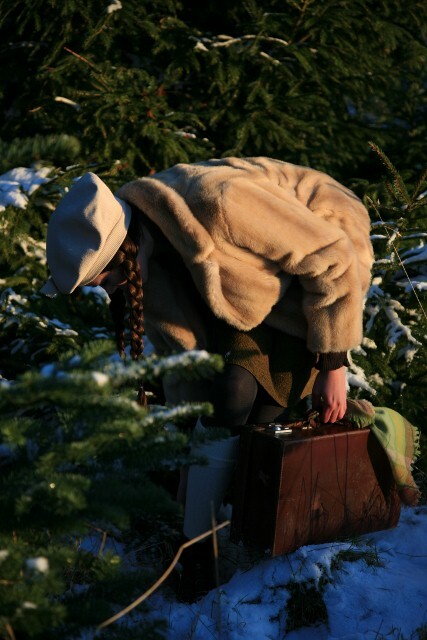 On the other hand, snow does make a rather attractive background for a shoot, especially when the theme is Narnia. There is a plantation of fir trees literally just up the road from us, and after a trudge past them to go sledging earlier that day the idea occured. I love the thought of a fantasical land in the back of a wardrobe, behind lots of warm furs (or faux furs here.) The outfit had to be quite WW2 forties-esque. I was kind of thinking of Susan in particular from The Lion, The Witch and The Wardrobe. The faux fur jacket is one I found in a charity shop for £6.95. This is a fantastic price for something that is both beautiful and actually really rather warm. The greeny-brown jumper underneath is.. wait for it.. vintage thrifted Jaeger! Yes, the obsession really does continue massively. The green skirt is one my Mum bought last weekend in that very predictable place- the charity shop. I love the texture of the wool. The white beret was my maternal great grandmother's- the one with the amazing hat collection! Twelve of the best hats from her are currently residing on two cork boards on my wall. The brown lace-ups used to be my mum's from the nineties but I 'borrowed' them and now wear them all the time. They've already appeared twice on this blog. The brown leather suitcase is one of a small collection we own that have come from various places. This one usually holds model tanks that my grand-dad made during the second world war (it used to be his.) Quite fitting really! The scarf tied to the handle is from the aforementioned great grandmother. The belt is recently thrifted. Actually, apart from the socks and tights, every item here is either charity shopped or family inherited! This is so typical of my style. I was thinking, the blog should probably be renamed something like 'pennies and shoestrings' or 'Roz's thrifted/ family hoarded finds'! I was so honoured to be featured on Judy's blog Atlantis Home yesterday, along with some sketches I did for her. I really appreciated it and am bowled over that she chose to do this, so a massive thank you to Judy! I've posted one of the four sketches below, to see the others take a look at her blog. I am also trying to set up a bloglovin' account, I'll let you know about that in more detail soon. WOW!! Gorgeous, absolutely amazing pictures. Digging the outfit for sure. This is such an adorable shoot! This is so vintage looking and wonderful. I really love the colors. And you look just like a girl from magical world. And your photos make own beautiful story. You have got very oryginal style! That looks soooo cold, but soooo nice. I recently stumbled on your blog and I love it! I wish I could shop your closet. This outfit is amazing. i really lvoe your narnia look, you lok so warm! 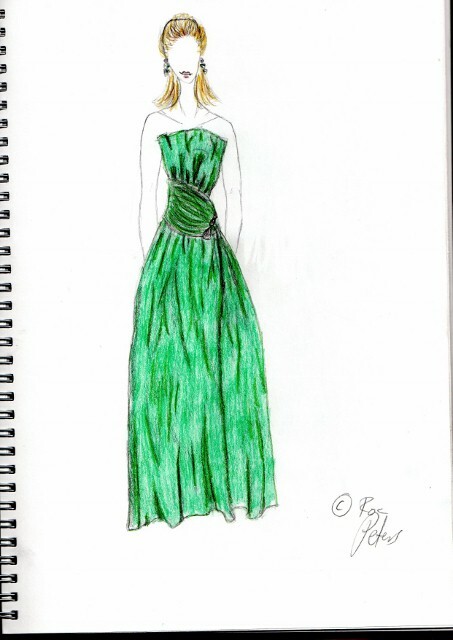 great sketch too, wonderful green colour! um, wow! these photos are worthy of a magazine editoral, really amazing! you are a doll! You have an amazing sense of style and your Dad is quite the photographer! I love nothing more than combing through thrift shops and secondhand stores - everything there tells so much more of a story. I'm glad Judy told us about you - you are a great find! Kudos to you and your dad...lovely post as always! You are so talented. Everything enchants the eye...the styling, the setting, the lighting, the clothes, and of course your ability to communicate with the camera. You are one of my must-read blogs! These are hands down some of the best pictures I have seen in fashion blogs. To reiterate what Lauren said, worthy of an editorial indeed!Magnificent!Bravo! I love this shoot: beautifull colors and adorable outfit. And your longs braids are so cutes! I a so happy I discovered your blog through "Atlantis Home!" I am totally smitten by your photos and your vintage style! i also love the pics in the post below, it's always fascinating to look at the pics on your blog! Wow amazing photos!Very magical,and I'm incredibly jealous of your outfit.Fur coat is dreamy,also the shoes and the case.How can you inherit so many things?? Your very lucky,I have no grandparents to inherit from! :(I think this is my favourite of all your shoots I've seen,and that sure isn't a easy thing to say. I just started following your blog and after this post I just had to make a comment! The photos really look like you're in Narnia. Great period outfit! Your outfit posts are always such visual delight! These easily could pass as stills from a fairytale movie, with you being the lost princess wandering through a snow-covered field. Your sketches are really nice as well! AHHHHHHHHHHHHHHHHHHHHHHHHHH EPIC. Narnia is my worllld. and this is the deepest perfection EVER. Are you really only 14? You seem and look much older. You do have an incredibly beautiful blog! I love your coat as well. I've been searching thrift stores for something similar for a while. The hubby and I just watched Narnia yesterday (it was on the tele)... :) Great photos!!! Wow, you have such a great sense of style! I had to do a double take because I thought these pictures came from a magazine. aw how cute that your father takes your photos! love how much thought you put into the photos! i start a photography class tomorrow night and am so excited! Absolutely divine. Your style is impeccable. I know I'm a bit late but I wanted to let you know I just discovered your lovely blog! You're gorgeous and your photos are really wonderful! the pictures are really nice, the colors are really sharp and look nice together. That's so cool that you were featured on Atlantis Home! will add your blog to my roll hope you can add me up too! :) wonderful blog you have!! I am so thrilled to have come across your blog - it's gorgeous. And as everyone else has said, these pictures are stunning. see your photos is a kind of inspiration for my closet!! Beautiful, I especially love the coat and the hate; very 1940's. Wow, I love this photoshoot. It really reminds me of Narnia. P.S. : I added your blog to my blog list. These pictures are so Narnia-reminiscent! They could almost be a Narnia-themed spread! Love the sketch and hope it warms up for you! Glad to have found you through Atlantis Home. Lovely photos. It's amazing how cute you look in this bitter cold! Your creativity and imaginative inspiration seem to be endless! Its a joy to watch. The light looks magical in these pictures and really adds to the theme. You live in a beautiful place. I came across your blog the other day and was absolutely taken by your beautiful photos. They have a real sense of atmosphere and are beautifully styled. You have a brilliant style and are as pretty as a doll, too! Such a lovely blog; I look forward to seeing more. Your blog is amazing! I love all your outfits, especially your fur coat! Do you have LookBook? I love the theme of this shoot! It really does seem like an outfit the Pevensies would wear! LOVE this outfit. Great shoot! And congrats about the sketches :) Your sketches are always fabulous. wow, such a perfect title for the photos. great styling. Such a classic look which I love love so much!! oh my goodness i love your blog. your pictures are simply beautiful! i envy your style. def following! so glad I found it. beautiful pictures! so cute and so narnia! Wow! I love Narnia movie, so those pictures remember the movie, this style of jacket is so beautifuel and usegul because it look very warm, I want one like this for the cold days! Excellent Blog!